Ryan Cunningham, Group Program Manager, 20 сентября 2017 г.
PowerApps now sports a better onboarding experience that gets new creators directly to the canvas, a new wizard-like configuration assistant for complex controls such as forms, galleries, and data tables, and — the feature we're most excited about — the ability to make your app respond to rules and conditions without writing a single formula. Now it’s easy to make your app respond based on the current value of any control property or data source. Just set your condition, then design the results right on the PowerApps canvas — all the necessary logic and formulas will be created for you automatically as you go! Select any control. Try starting with a card on a form. Add a condition. Choose from templates like greater than, less than, or even pattern matching. Customize your condition. Choose the control and property, as well as the right resulting value. For example: Slider1.Value > 5, or AccountStatus.Update = "Active"
Now for the fun part! Select +Define actions. Press "OK" on the dialoge to get started. Now you're designing what will happen when the condition is true. Use the full canvas to design what you want to happen when your condition is true. Change control sizes, colors, text, position, etc. You can do nearly anything in this mode with any control that's already on the canvas. When finished, select Done on the information bar. Now your condition is ready to go! You can add additional rules on the same control, and see a summary of your rules in the rules panel. PowerApps will create formulas for you automatically on the controls and properties you've edited. We've marked this first version of rule building in PowerApps "experimental" as we'll continue to update and evolve the feature over the coming releases. Share your feedback in our community and learn more about building rules in PowerApps. 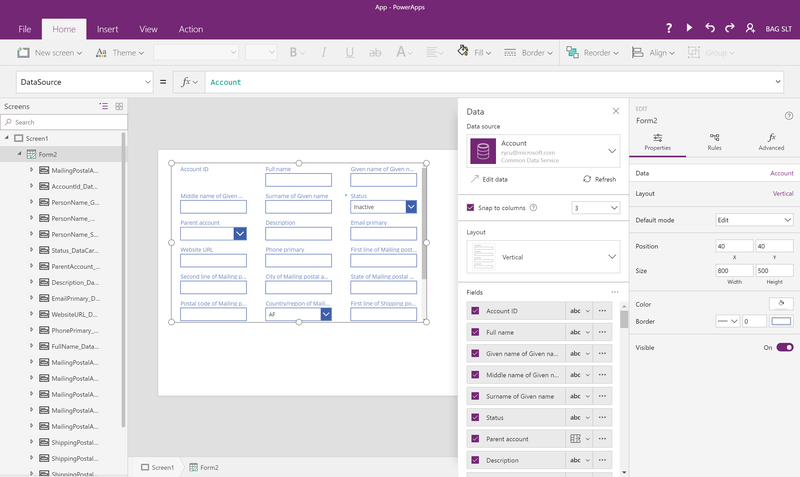 Now when you add any control that requires a data source, PowerApps studio will automatically open a full-height data pane to help you connect to the right source, choose your layout, and configure which fields you want displayed in the control. This works with forms, galleries, data tables, and more. To get back to the pane, just select "Data" from the top of the properties panel whenever you have the control itself selected. 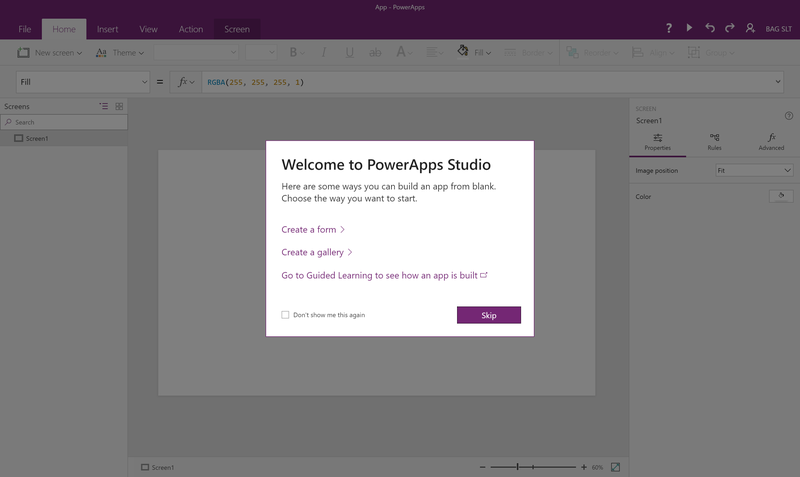 When creating a new app, PowerApps will greet you with quick tips contextual to the way you started — whether that was from blank, generating an app from data, using a template, or starting from SharePoint. You can always hide these if you're an advanced user, or get back to them any time by finding Quick Tips under the ? menu. These features are part of a larger effort to simplify app authoring while expanding what creators can do, and you'll continue to see iteration and improvement over the coming releases in all of these areas. Also, stay tuned for more new feature announcements coming over the course of the next week as we lead up to the Microsoft Ignite event. What kind of new announcements? Let's just say there is exciting stuff in store for SharePoint, the common data service, administration capabilities and more!